Texas Tax Free Weekend 2019 is scheduled for August 9th-11th, 2019. Texas Tax Free Dates below. Texas Sales Tax Holiday 2019 details released by Texas Comptroller of Public Accounts. As in 2016, the law exempts most clothing, footwear, school supplies and backpacks priced under $100 from sales and use taxes, which could save shoppers about 8%. Texas Tax Free Weekend 2019 starts August 9th, 2019 and ends August 11th, 2019. Tax Free Weekend in Texas details here. Texas Tax Free Weekend 2019 limits list available below. Texas Sales Tax Holiday Limits on Clothing and Footwear. Retailers are not required to collect state and local sales or use tax on most footwear and clothing that are sold for less than $100 during the holiday. Exemption certificates are not required. The exemption applies to each eligible item that sells for less than $100, regardless of how many items are sold on the same invoice to a customer. For example, if a customer purchases two shirts for $80 each, then both items qualify for the exemption, even though the customer’s total purchase price ($160) exceeds $99.99. The exemption does not apply to the first $99.99 of an otherwise eligible item that sells for more than $99.99. For example, if a customer purchases a pair of pants that costs $110, then sales tax is due on the entire $110. The exemption also does not apply to sales of special clothing or footwear that the manufacturer primarily designed for athletic activity or protective use and that is not normally worn except when used for the athletic activity or protective use for which the manufacturer designed the article. For example, golf cleats and football pads are primarily designed for athletic activity or protective use and are not normally worn except for those purposes; they do not qualify for the exemption. Tennis shoes, jogging suits and swimsuits, however, are commonly worn for purposes other than athletic activity and thus qualify for the exemption. The sales tax holiday exemption does not extend to rental of clothing or footwear; nor does it apply to alteration (including embroidery) or cleaning services performed on clothes and shoes. Additionally, tax is due on sales of accessories, including jewelry, handbags, purses, briefcases, luggage, umbrellas, wallets, watches and similar items. Backpacks priced under $100 sold for use by elementary and secondary students are exempt during the sales tax holiday. A backpack is a pack with straps one wears on the back. The exemption includes backpacks with wheels, provided they can also be worn on the back like a traditional backpack, and messenger bags. The exemption does not include items that are reasonably defined as luggage, briefcases, athletic/duffle/gym bags, computer bags, purses or framed backpacks. Ten or fewer backpacks can be purchased tax-free at one time without providing an exemption certificate to the seller. Texas families also get a sales tax break on most school supplies priced at less than $100 purchased for use by a student in an elementary or secondary school. Persons buying qualifying school supplies during the holiday are not required to provide an exemption certificate – with one exception. If the purchaser is buying the items under a business account, the retailer must obtain an exemption certificate from the purchaser certifying that the items are purchased for use by an elementary or secondary school student. “Under a business account” means the purchaser is using a business credit card or business check rather than a personal credit card or personal check; being billed under a business account maintained at the retailer; or is using a business membership at a retailer that is membership based. A sale of a qualifying item under a layaway plan qualifies for exemption if the customer places the qualifying merchandise on layaway during the holiday or makes the final payment during the holiday. See Rule 3.365(i). For information on how to report tax on these sales, please visit Reporting Sales Tax on Tax-Free Items. Source. 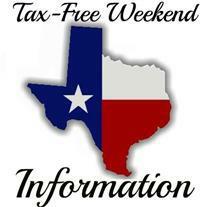 Texas Tax Free Weekend 2019 was announced by the Texas Comptroller of Public Accounts. We have all the Texas Sales Tax Holiday details including dates here. Texas Emergency Preparation Supplies Sales Tax Holiday, April 27-29. This holiday lets shoppers in Texas shop tax free for items such as portable generators, storm protection devices, first-aid kits and other related items. Texas Energy Star Sales Tax Holiday, May 25-27. This weekend lets Texans buy energy efficient items such as air conditioners, clothes washers, ceiling fans, dishwashers and certain types of light bulbs tax free. Texas Water-Efficient Products Sales Tax Holiday, May 25-27. Texans may buy water conservation or water efficient products — such as a drip-irrigation hose, plants, mulch, even rain barrels — tax free this weekend. Texas “Back to School” Sales Tax Holiday, Aug. 9-11. Parents, students and other shoppers may head to the stores to shop tax free for certain back to school clothes, shoes, school backpacks and other supplies.